Mette-Marit went minimal with her jewels, but Princess Martha Louise wore an absolutely enormous pair of statement earrings. The rest of the extended family, including Princess Astrid and her children, as well as the husband and children of the late Princess Ragnhild, also gathered at Skaugum. Harald's fellow Scandinavian monarchs, Queen Margrethe II of Denmark and King Carl XVI Gustaf and Queen Silvia of Sweden, were also in attendance. On Saturday evening, the royals gathered at the palace in Oslo. The gala was black tie, so no tiaras were worn, but the three queens in attendance managed to sneak in some major jewelry. Queen Silvia wore diamonds, including the family's large diamond floral brooch. 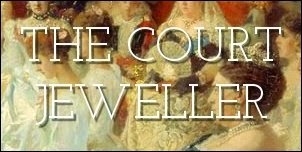 Sonja wore a jewel we discussed here last week: the Drapers' Company Brooch, which was one of Queen Maud's wedding gifts. Queen Margrethe wore her diamond and sapphire demi-parure, which is a legacy from Queen Alexandrine. Everyone who attended also walked away with a new piece o' bling: the official medal of King Harald V's Silver Jubilee.